Is the modern field of econometrics really closer to alchemy than to science as Keynes argued? 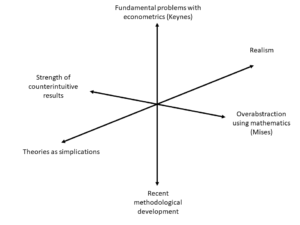 Certainly, some of Keynes’ critiques are still valid; in today’s terms econometrics is still hampered by problems of endogeneity, instability, non-stationarity, unknown functional forms, measurability and data dredging (5–7). Nevertheless, since those early beginnings new methods such as instrumental variables, difference-in-difference, vector autoregressive and (spatial) panel models and the rise of big data have added a whole new array of tools to overcome these problems. 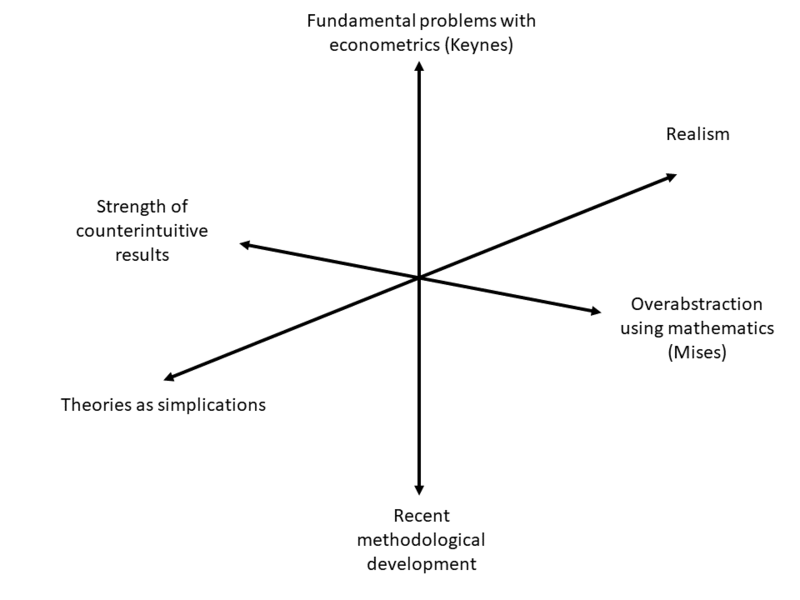 Despite its difficulties and the inevitable cost new methods come at, the field of econometrics is constantly evolving in pursuit of better techniques to study economics. Secondly, the use of formal models and abstraction in theory has raised concerns about the real-world implications of economics as a science. For Mises and Austrian economists in general, the language of mathematics and econometrics is too confining since it does not allow to express and test notions of causality, respectively (8). Certainly, we should not let the applicability of mathematical and statistical methods define the scope of economics. Moreover, we should be very wary of mathematically tractable and elegant but absurd theories (a good example is the family of rational addiction theories) (9). Just as correlation does not imply causation, mathematical tractability does not necessarily explain human actions. Yet, there is still much to say in favour of formalism. Mathematical methods can relieve the cognitive burden of conceptual and qualitative modelling. While without doubt, there are very intelligent people in economics, intuition and common sense might not be adequate for understanding the complex interactions and trade-offs in the real economy (10). A certain level of formalism allows us to more accurately formulate, question, and study economic processes (9). Keep in mind, though, that whether a finding is intuitive or not should not be taken as an indicator of its validity (11). Apart from counter-intuition and complexity, the human mind is also vulnerable to story-telling. Our subjective feeling of understanding makes us susceptible to believing good stories without evidence and ignoring evidence without a story (9). The previous paragraphs have hopefully shown that all hope for quantitative economics is not lost. While misapplication of formal methods in economics is a problem, those methods do have their value—when applied properly—and should not be discarded altogether. The question that remains, though, is how to proceed. To end, therefore, I want to offer some suggestions that might avoid quantitative economics from turning into a purely academic discipline. Firstly, it is always a good idea to complement quantitative models with qualitative or conceptual models that allow for “a full, verbal explanation of the theory” (9,10) in order to (i) avoid foolish assumptions (e.g. to make models tractable, or ideologically minded “intuitions”) and “mathematical gymnastics” (8), (ii) to make models more comprehensive (given limitations in modelling), and (iii) to think of contradictory evidence. Secondly, the comparison of descriptive statistics (14) with simple and state-of-the-art econometric methods allows to put results into perspective and helps recognising methodological artefacts and spurious correlations. Lastly, we should recognize the importance of context; to quote Dani Rodrik again: “The correct answer to almost any question in economics is: It depends.” (13) Insofar economists do not already do so, they should leave their ivory towers and obtain the field expertise needed for correct model building and application (15). Tieleman J, De Muijnck S, Kavelaars M, Ostermeijer F. Thinking like an Economist? Rethinking Economics NL; 2018 Mar. Keynes JM. On a method of statistical business-cycle research. A comment. The Economic Journal. 1940;50(197):154–6. Keynes JM. Professor Tinbergen’s method. The Economic Journal. 1939;49(195):558–68. Garrison RW. Mises and His Methods. In: Herbener JM, editor. The Meaning of Ludwig von Mises. Dordrecht: Springer Netherlands; 1993. p. 102–17. Rogeberg O. Taking Absurd Theories Seriously: Economics and the Case of Rational Addiction Theories. Philosophy of Science. 2004 Jul;71(3):263–85. Krugman P. Two cheers for formalism. The Economic Journal. 1998;108(451):1829–36. Diener E, Lucas R, Helliwell JF, Helliwell J, Schimmack U. Issues Regarding the Use of Well-Being Measures for Policy. In: Well-being for public policy. Series in Positive Psychology; 2009. p. 245. Borjas GJ, Van Ours JC. Labor economics. McGraw-Hill/Irwin Boston; 2010. Rodrik D. Economics rules: The rights and wrongs of the dismal science. WW Norton & Company; 2015. Goertzel T. Econometric modeling as junk science. The Skeptical Inquirer. 2002;26(1):19–23. Boumans M. Methodological institutionalism as a transformation of structural econometrics. Review of Political Economy. 2016 Jul 2;28(3):417–25. Du Gard RM. Lieutenant-colonel de Maumort. Alfred A. Knopf; 2000. 777 p.